A little more than four years ago, longtime friends Tom and Carman Duvall, and Kiers and Steve Rowley reminisced at dinner about their lives in the 1980s, long before their schedules had grown complicated and filled with endless trips driving children to various activities. Tom, a child of 1980s rock and roll, wondered aloud whether Def Leppard might perform for them on his next birthday. Conversation meandered during the evening, and when the check arrived, Tom and Steve advised Kiers and Carman that a date had been set for a rock concert on the Duvall property in Independence, Missouri, and that it would be a fundraising event to support patients suffering with cancer. Kiers, who’d struggled with lung cancer for the past five years, and Carman announced “We’re in.” So began an all-day-long summer music festival and tradition resembling Woodstock, that the four friends named Tomstock. Event guests lined the Duvall property with RVs and tents, in which they constructed makeshift bars, bean bag games, and bounteous foods from snacks to Kansas City barbeque to share with whomever passed their way throughout the day and into the night. The celebration ended long past midnight with a July Fourth-style fireworks exhibition. Transportation to the event took a handful of forms, from limousine busses to a bus normally used to transport prisoners, to a helicopter that landed with its pilot’s hope that he might be invited to stay. 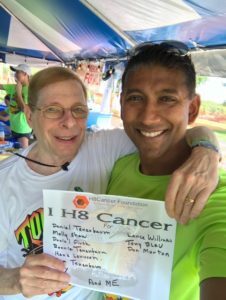 Cancer Commons founder and board chair Marty Tenenbaum thanked the crowd for what each and every person in attendance has made possible for cancer patients, by way of their contributions to the H8 Cancer Foundation. “There’s no one who knows as much as everyone,” he told the crowd from the stage. He described how we at Cancer Commons connect every patient who reaches out to us with expert physicians and scientists, then capture their treatment recommendations and reasoning, learning from every patient’s every treatment, and sharing that knowledge with the next patient. Kicking off the evening’s performance, the crowd held up placards naming their friends and family members who had been touched or lost by cancer. The placard’s flip side noted a phone number where donations to the H8 Cancer Foundation may be texted, and a drone flew over the crowd, capturing video of people holding up their placards. The evening’s most powerful moment brought cancer warrior and event host Kiers Rowley onto the stage, where she took the mic and joined Arch Allies’ lead singer in a duet of Journey’s “Don’t Stop Believin’.” Nearly 2,000 voices sang with her. In the spirit of “Don’t Stop Believin’,” we at Cancer Commons are extremely grateful to the H8 Cancer Foundation for its support, to the Rowley and Duvall families, and to every rocker who attended Tomstock 2017. We hope the Tomstock story inspires you to join the Cancer Commons family in contributing to better treatment options for all cancer patients. For more photos of Tomstock 2017, see our Facebook album.